Passion is one of my most favorite words. Put “profit” in the mix and it makes a great team. 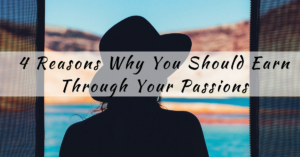 So in today’s guest post, Teresa of Full Life Cube is going to share with us why we should earn through our passion. One of my favorite advice to moms who want to work from home is to consider their natural interests or passions. I’m an advocate of making your passion your profession. Let me share with you why. The first reason is that you can produce better outputs when your work is aligned with your area of interest or passion. You’ll be more motivated to do a good job at it because you are passionate about it. Also, because you are passionate about it and you like doing it, most often than not, you are also good or skilled at it. The better output that you produce means better chances of you being noticed in that area. That means more work opportunities for you and better pay. The second reason is that you can work faster. You produce the required output in a shorter amount of time than when it is in an area you hardly know about or you are not interested in. We have a human tendency to procrastinate work that we do not like. Also, if we hardly know that field, we would spend more time researching and studying it. More time at work means less time with your children. The third reason is obvious. You will enjoy working on projects that are aligned with your area of interest or passion. It’s like you’re just playing and not working at all. I sometimes find it hard to stop myself from working on my projects because I love what I do, especially writing about topics I’m very passionate about. It doesn’t feel like work. It’s like I’m just spending time on a favorite hobby, which is partly true because most of my work now started out as hobbies. The fourth reason is that you will find your work meaningful and because of that you will feel fulfilled. When you work on something that you feel has a lot of value, it lifts your spirit and it makes you more alive. A priest once shared in his homily that our work or our jobs should make our spirits feel the presence of God and that those we work with or who encounter our work should also experience God through us or the work that we do. Working passionately, producing quality or excellent work and doing our job joyfully are some of the best ways to live meaningfully. “Life-fulfilling work is never about the money — when you feel true passion for something, you instinctively find ways to nurture it,” said Eileen Fisher who is a fashion designer. So, while you are waiting for those opportunities to earn from your natural interests and passions, keep cultivating those gifts or skills. Keep practicing them. Time will come when you’d be able to monetize them. Don’t give up! Teresa is a bestselling author, inspirational and motivational speaker, and business owner. She has already published five books. She blogs about family life, motherhood, homeschooling, work and business at Hands-On Parent while Earning. She is the President and Founder of Full Life Cube. She inspires and equips her clients to succeed in their businesses/careers while living out their priorities and purpose through her services as a consultant (for management, human resources and training solutions), career/parenting coach and counselor.